Mandap, which changes a girl’s life forever, is a special place for both bride and bride’s groom and a main attraction of an Indian wedding. Just because a couple takes vows to love each other for their entire life and the special rounds, called ‘pheray,’ are taken on the mandap, this sacred tent becomes a memorable platform for the couple as well as their families. Since it is a life-changing stage, it has to be fragrant, colorful and well decorated to give couple an eternal bliss. A beautifully decorated Mandap, therefore, is integral to make a wedding more gorgeous. A perfect mandap is one where a father gives his daughter’s hand in someone else’s hand, a place where a girl steps into a new life where she expects everything to be of her choice. In short, a customized mandap makes a perfect mandap. It could go as traditional as a bride wants or as contemporary as she wishes it to be. The lights, floral décor, seating arrangement, pillars, backdrop, etc. in sync collectively make it a perfect mandap. Indian weddings are famous for being a colorful event. Gorgeous and delicate dresses, feast, sweet meats, music, dance, garlands add glee in the wedding. However, Mandap remains center of attention. 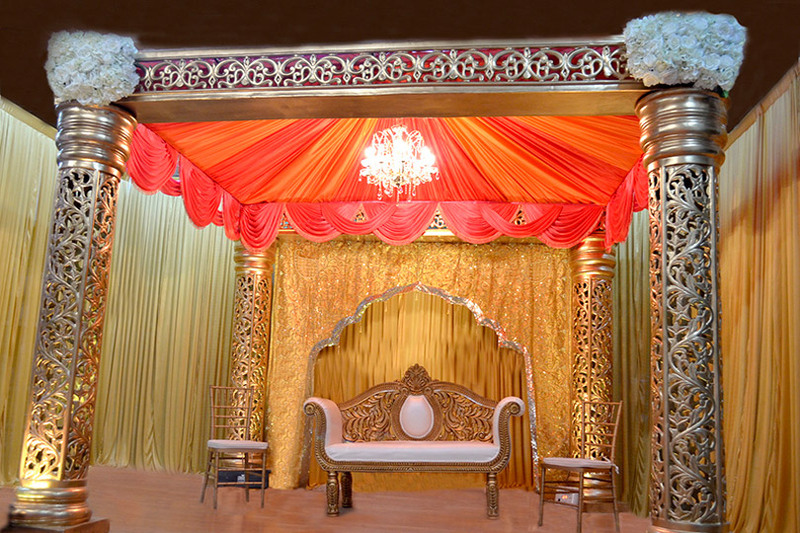 Indian Mandap décors range from traditional to modern styles. The former could be made further personalized for the couple. For example, an Indian bride may want South-Indian style mandap or a Gujrati style mandap. The decoration for both vary because of difference in traditions in each state. Besides specific styles, there are other details that a couple or a bride provides, which can make a mandap as well as the ceremony look more exquisite. Some prefer open mandaps when the aim is to make it easier for guests to view the function. The color combinations that people usually use to decorate their mandap with are red, golden and silver, but it depends on the choice. The mandaps can now be enhanced with other colors and special themes as suggested by a couple. The lights also play an important role in giving a great look to mandap. However, this too depends on the choice of a bride and the couple if they want to have sufficient lighting or less. The backdrops could be designed on a particular theme or could be kept traditional and simple if a couple likes their Mandap to give a typical Indian look. Curtains and drapery further beautify the outlook of mandap. However, best is to avoid gaudy hues and use a good fabric which has a great fall. Mandap adds beauty to an Indian wedding and the ethereal, colorful and well planned decorations enhance the Mandap. Glamorous Event Planners offer all kinds of Mandap decors in NY which add grace and brilliance in your wedding.